Arizona brings to mind a hot desert environment, and that is indeed the case in the southwestern part of the state, which is in USDA Hardiness Zone 10. The environment and the type of soil, the two determining factors in whether or not a plant will grow in an area, are influenced by the mountains and the wide differential in elevation across the state. The coldest part of Arizona is in USDA Hardiness Zone 5, the same as New York City and Southern New England. The only type of soil not found in Arizona is tropical soil. Know your USDA Zone. Find out what type of soil you have and amend it if necessary. Many shrubs are very adaptable, making the Arizonian gardener’s job easier. Old fashioned weigela (Weigela florida) is native to Japan and hardy in USDA Zones 5 through 8. The plant is a large deciduous shrub that grows from six to nine feet tall and nine to 12 feet wide with oval-shaped, medium-green leaves that grow up to four-and-a-half inches long. The funnel or bell-shaped flowers are a deep rose-pink, measure one inch across and appear in May. Plant old fashioned weigela in full sun. The plant prefers a well-drained soil, but is adaptable to other situations. Koreanspice viburnum (Viburnum carlesii) is a native of Korea and a member of the honeysuckle family. The plant is a medium-sized shrub, growing up to eight feet tall and eight feet wide. The plant produces deciduous, fuzzy, gray-green or blue-green leaves that turn to bronze or wine in the fall if the shrub is planted in the sun. The white flowers are accented with pink, bloom in mid-April and last for two weeks to be followed by clusters of green fruit that change to red and finally to black as they ripen. 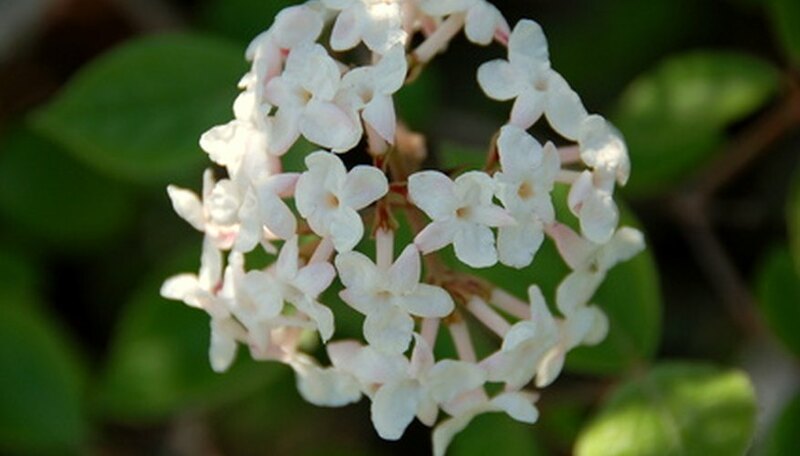 Plant Koreanspice viburnum in full sun or partial shade and a soil that is moist and well-drained. The flowers have a heavy fragrance, so plant where the breezes will disperse the fragrance to where you can enjoy it. Purpleleaf sand cherry (Prunus x cistena) is a medium-sized shrub and a member of the rose family that enjoys a sunny spot and a moist, well-drained soil, but can thrive in Arizona since it adapts to dry soils, heat and drought. The shrub grows up to eight feet tall and eight feet wide, producing leaves that start out as red-purple and turn crimson-purple for the summer and bronze-green in the fall. The flowers appear as pink buds at the same time as the leaves and open up to reveal white-pink flowers starting in April. The flowers give way to small black-purple fruits. The shrub is hardy in USDA Zones 2 through 8. Where Can I Buy a Bourbon Rose Bush Called Maggie?